Developer Quote: "InstaTiling is an app that enables you to crop your photos into multiple squares (tiles), then arrange them on your Instagram profile page." Clever photographic tricks abound these days using the software installed on your computer or on your mobile device. You actually don't need to be creative at all to make a masterpiece out of your photos. Just use the given templates and the many artistic tools included in software, and you've got the makings of a gorgeous photo creation. 1. Load multiple photos, crop your input photos into multiple squares, then arrange and post them on Instagram in any grid pattern you want (see Screenshot 1,2,5). 2. Add tags, captions, and comments to the cropped photos within the app, and you can copy the tags to all other cropped photos with just one button tap (see Screenshot 3). 3. The UI is optimized (Version 1.2) for you to quickly and easily make banners. The "Fit" function can automatically fit your loaded photo into the squares you have selected. 4. Upload the cropped photos to Instagram in the correct order from within the app. The app will track which cropped photos have been uploaded so that you won't forget what should be the next one to upload (see Screenshot 4,5). 5. You can also save the cropped photos to your camera roll, then upload them later in Instagram. 6. 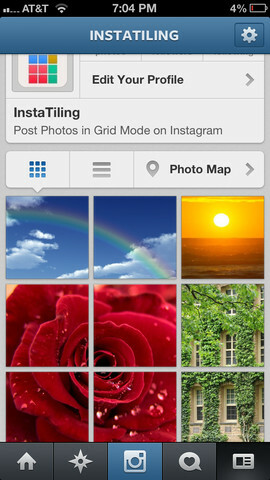 You can load multiple photos for cropping and tiling, to make frame-like patterns on your Instagram profile page (Screenshot 4). 1. To make large banners (e.g. 4x3 banner), you can use two-finger tap to quickly select multiple squares. 2. 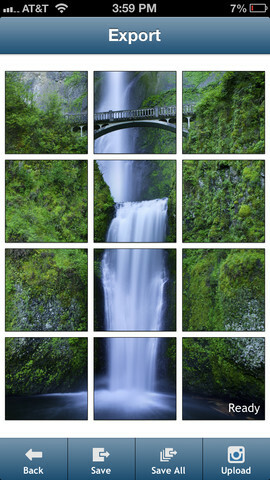 You can use the "Fit" function to quickly fit your loaded photo into the squares that you have selected. 3. The vertical stripe patterns (e.g. three 3x1 stripes like in the Screenshot 4) will never get messed up when you add another one or two photos into your Instagram profile (Don't believe? Try it out). You can get as creative as you like with this multi-dimensional, photo effects app. If you want to use one photo only to be transformed, you can do so. For the adventurous, maybe choose a few more photos to tell an intriguing story. After you have added your first photo, just tap the Open folder icon to add another photo. 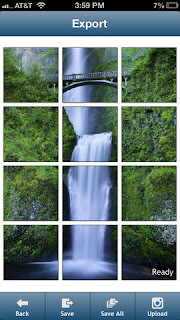 Arrange your photo across only the squares you want, it's all up to you! Add comments to one or all squares. The copy and paste function makes it simple to duplicate your tags. The end result with InstaTiling is a stunning graphic of several of your favorite scenes, or an image of just one photo that's big and bold as life itself. COOL CONCLUSION: When you want to tell a visual story that is both eye catching and cleverly arranged, use InstaTiling to create beautiful designs out of your photos. --Device: Compatible with iPhone 3GS, iPhone 4, iPhone 4S, iPhone 5, iPod touch (3rd generation), iPod touch (4th generation), iPod touch (5th generation) and iPad.